Operation of the internal combustion engine is dependent on three main factors: the amount of fuel, the amount of oxygen and ignition timing. These three need to work together and complement each other in order for the engine to perform as it should and their cooperation is controlled by the electronic engine management system. It adjusts each of these factors to make them complement each other and also sets up a number of filters and limiters in order to get the right information and ensure safety and reliability. What we do with your engine is improve the combustion process and thus make the engine more efficient. All of the modifications we perform are based on real time measurements, meticulous calculations and numerous tests and data logging which means we do not guess anything or gamble by increasing the values of the turbo pressure, or injection. While performing modifications, we follow the OEM (Original Equipment Manufacturer) architecture and keep the same level of quality and reliability while ensuring better performance. After ZIP tuning modifications your engine will have more horsepower and more torque and you will notice this as soon as you drive out of our workshop. The increased amount of torque results in noticeably higher efficiency and smoother ride in everyday conditions. The correct ratio in the air and fuel mixture is always measured before tuning. After that we modify the values and perform additional measurements with our data logging equipment to make sure that the proportions of air and fuel are perfect. A deviating lambda value coming from a mechanical problem on a particular car, or a mistake in remapping itself can have disastrous consequences. During data logging we measure the air intake temperature. This is one of the ways to verify that our modification is safe for your engine. Some customers have even had higher performing aftermarket intake air filters installed in the wrong place, thus feeding the engine with the air that is hotter than it should be and causing dramatic performance drops and unreasonably and dangerously high temperatures inside the engine. Having these temperatures at their optimal levels is another sign that our modifications are safe for your car. This is why these are measured during data logging. When tuning gasoline engines, in addition to increasing the turbo pressure and injection, we also adjust the ignition by advancing it or retarding it, as necessary. The changes we make during tuning considerably affect combustion and this calls for an adjustment in ignition timing. The results of proper ignition timing are more efficient combustion and more power and torque. This optimization also benefits the exhaust system and turbocharger and controls the explosions inside the engine. Inefficient combustion is the prime cause of engine damage on gasoline engines. This is why we make sure that we modify the ignition timing and make it perfect by checking the engine operation numerous times during our data logs. Some tuners gamble by adding a certain percentage of boost pressure and fuel without adjusting them to match, or testing thoroughly before and after tuning, or they simply purchase ready-made software on the internet, but this is far from being recommended. It is of the highest importance to know how the engine works and what kind of a setup the paths of fuel, air and ignition have. Many customers feel that if they can notice the power increase after tuning that it is a job well done. However, simply having more power does not mean your engine is tuned optimally. In most cases this will result in adjustments that are completely illogical when compared with the OEM setup, often inefficient and sometimes even harmful to the engine. In order to prevent all these we perform data logging. Data logging is performed during the software modifications and it includes measuring the air/fuel ratio, turbo values, ignition and various temperatures and it is practically irreplaceable if you want a safe and reliable car after tuning. Requested and actually delivered boost can vary so we make sure to measure it in order to have the correct information. After that we perform the modification and check to make sure that the actual operation is as it should be. Every turbo system is subject to wear which can alter its performance so it should by no means be adjusted without having all the information about that particular car. Many tuners will often increase the boost pressure to unnecessarily high levels, especially in diesel engines, and this inevitably leads to higher wear and premature malfunction. In addition to measuring the air inteke temperature, we also measure the exhaust gas temperature during data logging. A mechanical problem or a bug in the software modification can cause excessive temperatures which can cause damage to the turbo and exhaust systems. This is why controlling these values before and after turning is of the highest importance. 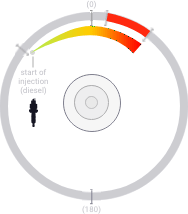 Aside from increasing the injection period, it is also important to optimize the injection timing. Adjusting the exact moment when the ignition starts and making it perfect is very important for ensuring the best possible combustion wave and the best possible torque peak. This results in a more efficient combustion process and an increase in torque and power. This optimization also benefits the exhaust system, DPF and turbocharger and also optimizes ignition. We always make sure we provide the optimal settings. We always check to make sure that the effects of our tuning are as noticeable as they are safe. This may sound strange, but it is often the case with some tuners that tuning is performed with WOT (Wide Open Throttle – 100% throttle). However, vast majority of driving time is not at full throttle, which means that you will not notice the benefits of tuning most of the time. This is why we make sure that you feel the additional power even at lower throttle positions. The “wow” effect is much greater with our tuning. 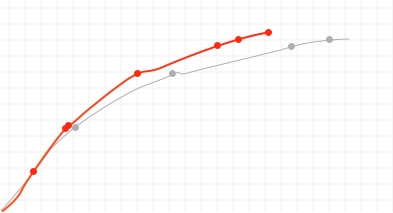 In addition to improving power and torque, we further improve the acceleration time of the vehicle. We reduce the delay in ignition so that the engine reacts instantly without making the accelerator pedal more sensitive. We also greatly improve the driving characteristics by reducing the "lag" in the throttle response. This improvement is particularly noticeable when driving at low speeds and you want to speed up suddenly, or when you press the accelerator just after braking. Our expert engineers at ZIPtuning have paid a lot of attention to a number of parameters in the software that are directly related to fuel consumption. Depending on the driving style and fuel quality, lower fuel consumption can be achieved! Tuning gives more torque at low RPM. If the torque buildup is too extreme, your clutch and driveline can be damaged. We gradually build up torque delivery so that the gearbox and clutch are never overloaded and the power and torque delivery is always pleasantly smooth. Our engineers have made it possible to adjust the code structure of the ECU. This allows us to change and add functions. Some of the changes to the code structure increase the torque limit which is normally only possible by using calibration data or by using piggyback devices. This offers our engineers the possibility of not having to comply with the transmission software, which means that we exceed the expected capital gains. However, we are always within the mechanical safety borders. ZIP's ECU Explorer and Mapdriver provide full access to any table and map, including all variables within the engine management system. As a result, we are not limited by the software as is customary for most tuning companies. Through our map drivers we bring the software optimizations to a higher level. In order to protect your parts we have incorporated a number of smart and adaptive safety features in our tuning software. For example, when the atmospheric pressure is low, the boost demand is automatically reduced, which protects your turbo system. This is very common when you are driving in the mountains. In case the measured temperatures of the intake, exhaust and oil are high, the demands for fuel injection and turbo pressure are also automatically different. If you pour fuel that is of lower quality than regular, the engine can detonate. In this case the ignition is delayed and the boost pressure is reduced which eliminates the possibility of a detonation which can seriously damage the engine. By making sure that the torque buildup is gradual and that the maximum value never exceeds the levels deemed safe by the manufacturer we protect your gearbox, clutch and driveline. Our software is developed to preserve or even reduce CO2 emissions. Are you looking for even more power in a reliable way? Then we have stage 2 tuning for you. With this tuning, in addition to the software, we optimize a number of components that increase the efficiency of the engine. Pay attention! 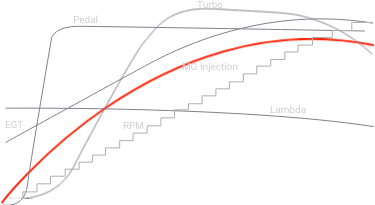 The prizes for a stage 2 tuning are substantially higher than our stage 1 tuning. The stage 1 chiptuning has been developed for the original parts of the car and therefore requires only a software adjustment and less labor. If you are not looking for hardware modifications, but only for a software modification, we advise you to do a stage 1 request. Stage 3 tuning includes more efficient forced induction parts and they require complete customization. If you are interested in stage 3 tuning, contact our dealer in your area.